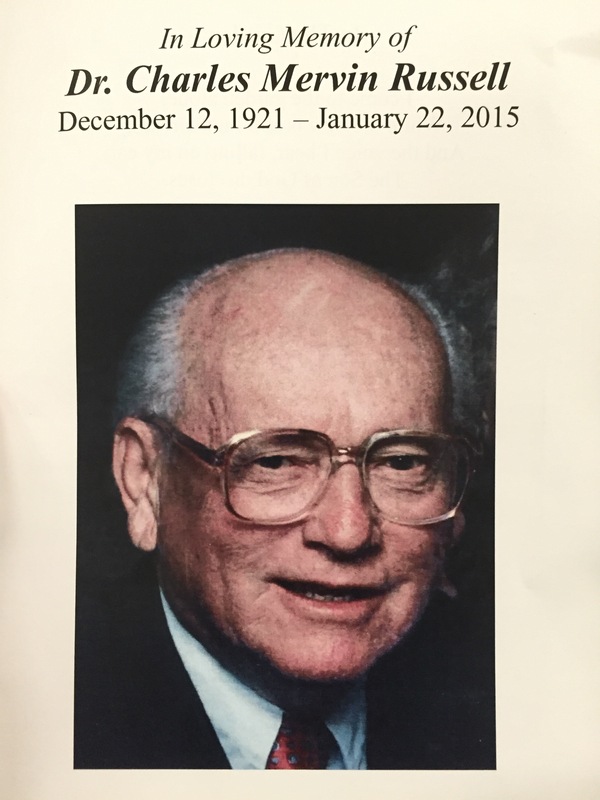 This past weekend we celebrated the life of my grandfather, Dr. Charles Mervin Russell. Grandpa lived a full life in his 93 years (December 12, 1921 – January 22, 2015). As I have been reflecting on Grandpa’s life this past week, a friend drew my attention to a verse in Hebrews 13. “Remember your leaders, those who spoke to you the word of God. Grandpa Russell was one of the people in my life “who spoke to [me] the word of God.” Based on the verse above, I’m called to “remember” Grandpa, “consider” the outcome of his way of life, and to “imitate” his faith. I’m sure you can think of people in your life who have lived in such a way that you need to remember, consider, and imitate their lives as well. As I remember the life of Grandpa, there is a lot to consider. Though I will not go into too much detail in this post, here are a few of the highlights. Grandpa was a pastor who served four Free Methodist churches in the Midwest. Grandpa was a youth leader who served as a regional director for the Free Methodist Youth. Grandpa was an evangelist who served as President of World Gospel Crusades and gave leadership to some 22 large scale crusades throughout the world. Grandpa was a pilot who used his skills for missions aviation work as founder and President of Mercy Airlift. As a pilot, grandpa logged over 6,000 hours flying through 23 different countries. His aviation career began in his early days with a Piper J-3 Cub to later days flying relief supplies to places as far as Ethiopia in Mercy Airlift’s DC-3. Grandpa’s love for the Lord and love for people compelled him to travel to over 69 countries in order to share the good news of the gospel and provide relief supplies to those hit by severe natural disasters and famine. He felt called to minister to both the physical and spiritual hunger in people’s lives, and did this faithfully throughout his life. Grandpa became a follower of Jesus in Lakeland, Florida. Shortly after becoming a Christian, as a teenager Grandpa share the good news of Jesus in his hometown by visiting every home in Palatka, Florida. This passion that began in Florida carried him on a journey of sharing the good news of the gospel with people throughout the United States and in as many as 69 countries. Dr. Charles Mervin Russell lived his life well. It is a joy to remember this life. It is a joy to consider the outcome of his life. And, by God’s grace, I hope to imitate the faith that was alive and well in Grandpa’s many decades of life. Interestingly, there is a powerful verse that immediately follows Hebrews 13:7 (the verse shared above). Consider the outcome of their way of life, and imitate their faith. Because Jesus Christ is… because Jesus is the faithful one who is the same today as He was in the past and will be in the future… we can have confidence that He remains at work today in our lives. As we consider those who have gone before us, the same God that guided and shepherded them in their lives is able to guide and lead us as well. And so, I remember Grandpa’s life, I consider the outcome of his life, and by God’s grace, I will seek to imitate the faith that was at work in his life as well. Leading from the front requires leading with vision! 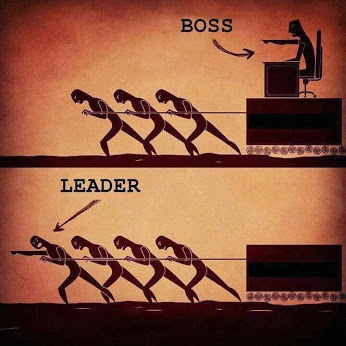 In this brief post I encourage you to consider whether you’re leading from the front or whether you’re leading from behind. Are you calling people to an inspiring vision of what can be, or are you pushing and prodding followers to do what they really are not committed to already? Vision helps to motivate followers intrinsically rather than extrinsically. Vision helps to lead from the front!